The detention center used by Australia to house asylum seekers on Manus Island will close, Papua New Guinea’s Prime Minister Peter O’Neill announced Wednesday, after the nation’s Supreme Court ruled that the confinement of refugees at the camp was illegal. About 850 men, half of whom have been awarded refugee status, are held on the tiny Pacific island north of PNG. On Tuesday, the nation’s Supreme Court found the offshore processing center unconstitutional, ruling that it violates detainees’ right to personal liberty. Australia’s hard-line approach to asylum seekers who arrive by boat — by transferring them to detention facilities on Manus Island and Nauru — has drawn criticism from human-rights groups and the U.N. refugee agency. In 2014, a report from Australian Human Rights Commission found evidence of abuse on Nauru, including allegations of sexual assault of children. 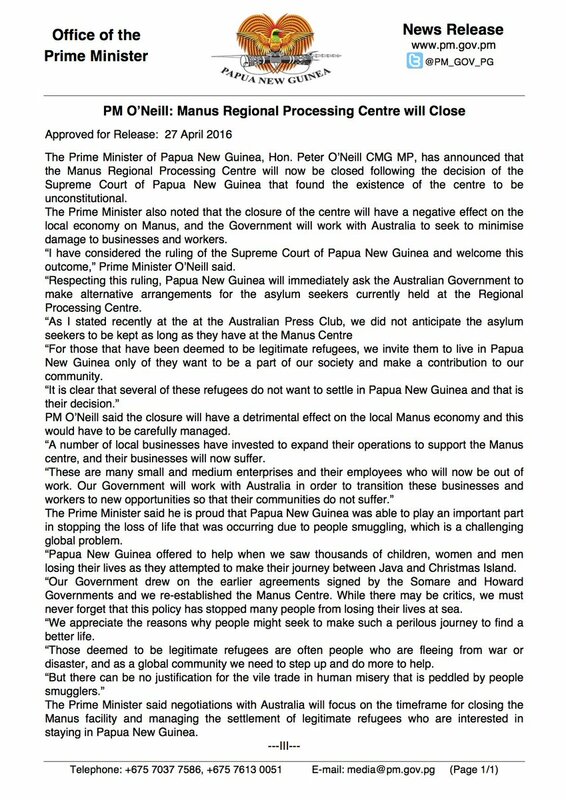 A time frame for the camp’s closure still needs to be decided, PNG’s Prime Minister said.